Lessons Changing Chords in "Can the Circle Be Unbroken"
Let’s smooth the moves on Can the Circle Be Unbroken. Here’s what it’ll sound like. I’ll just play A and D here as an example. Don’t play along yet, just listen to and watch me lifting my fingers on the and-of-four. See me lifting my fingers on the and of four? Now I’ll teach you how to turn the first transition in “Circle,” the move from A to D, into a smooth move. Once you’ve gone through the process, you’ll know how to apply the same set of exercises to the other transitions in the song, and you can just work your way through the song until you’ve smoothed out each transition you’ll encounter. So here’s the secret recipe for smoothing out chord changes I’ve developed for my private students over the years. We’re going to start with step one: Lifting. One note before I demonstrate this: We’re not going to lift all three fretting fingers. We’re using our third finger as a lead finger when we move from A to D, right? So it’s just our first and second fingers that we lift. So we’re going to practice this by grabbing an A chord, giving it a test to make sure it sounds OK, and then lifting the first and second fingers a centimeter or so off the strings, keeping the third finger in place. Replace the fingers you just lifted, and test again to make sure they found their way home. Lift again, replace, and test. Lift, replace, test. 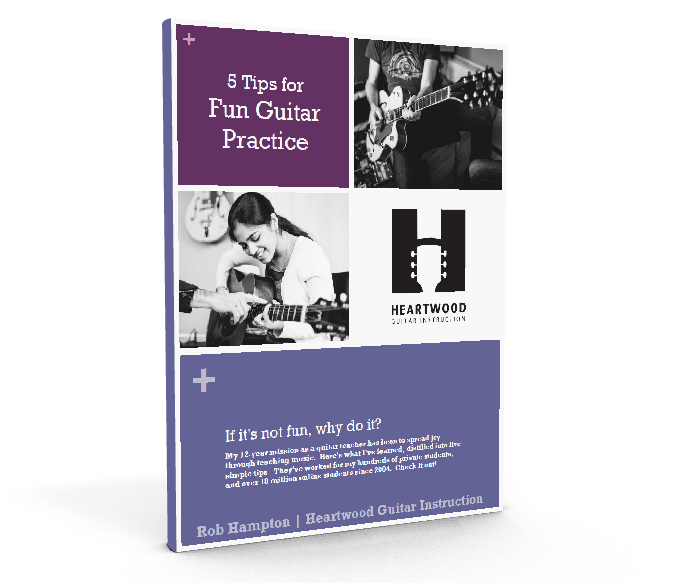 One of your big challenges as a beginning guitarist is to develop finger independence. Your untrained fingers are like anchovies in a school, always moving in tandem. We’ve got to teach them to be sharks. The next step is to learn how to lift at the right time. You’ll be lifting right before your last upstrum in the measure. We’re just going to isolate that one skill--you’re not going to move to the D chord yet, that comes next. You don’t want anything to distract you from the task at hand. Now let’s practice landing on the D chord after you’ve lifted. You’re probably going to have the urge to get to that D chord as fast as you possibly can, so that you don’t break rhythm, which is an admirable impulse. But right now you’ve got too much other stuff to think about to preoccupy your mind with rushing to the D chord. So break rhythm after you’ve lifted and bide your time moving over to that D chord. Once you think you’ve got everything in its right place, test that D chord to confirm. If you hear anything wrong, fix the problem before continuing. Go back to A, and repeat. Once you’re through five or ten correct repetitions, you can probably start speeding things up. Again, keep working on this until you can make the change to the D chord without breaking rhythm. Rewind and play along with me, or pause and do it on your own. Now play along with me. If you’re feeling rushed or you get sloppy moving to your D chord when doing this, you should go back to the learn to land exercise. Keep practicing this until you can consistently land on the D chord correctly. Either rewind and play with me, or pause and do it on your own. Now let’s work on the next transition. If you look at your chord chart, the next chord change is D back to A again. You can probably skip the first two steps--the lifting ones--because you’re going to be lifting your second and third fingers again, and you’ve already practiced that movement, while holding an A chord. Doing the same movement while holding an D chord is very similar. So let’s skip straight to the landing steps. Grab your D chord, and just watch me this first time. I’m going to strum the pattern for one measure, and on the upstrum, I’m going to lift, and taking my time, move to the A chord. Test the A to confirm you did it right, fix any problems you hear. Then grab the D again and repeat. Finally, we’ll practice landing on that A chord while keeping the beat. We’ll choose a nice, slow tempo. This is what it’ll sound like. You should have a good idea now how this process works, so I’m just going to mention the two other transitions you need to drill and then send you on your happy guitar strumming way. Both these transitions have you lifting all three fingers--no anchor or lead fingers to use here, unfortunately, but since lifting all your fingers is easy--the anchovies are happy to move together--you don’t need to do the lifting exercises. So just exercises 3 and 4 for each of these transitions. One last thing I should mention before we finish this lesson is that, when you’re actually playing the song, the last downstrum you do at the end of the Step 4 exercise, when you land on the new chord and strum down, you don’t just stop there and clock out for the day, right? That strum is going to be the first downstrum in a new repetition of the strum pattern. So you may want to take a moment to see if you can keep the strumming pattern going as you move from chord to chord. Try each transition individually like this [perform A → D], and then try the whole A D A E progression like this, maybe just one measure per chord to keep things moving. If you’ve gone through all the previous exercises, and repeated them enough, you should be ready to strum “Can the Circle Be Unbroken” along with the slow backing track. Since this will still probably be a big challenge, I’ve made a video of me playing along with the backing track, which should be a little easier to play along with than just the audio track. C’mon and check it out.